ARTfarm Saturday! 10-12noon, Extra Flavor Plus Plants! Happy Saturday! Open 10am – 12noon this morning! ARTfarm is still pumping out some fresh sweet juicy produce despite the severe drought conditions on the South Shore, so our food has extra intensity of flavor! Microgreens, arugula, sweet and spicy salad mixes, Swiss chard, broccoli leaves, kale, Chinese cabbage, beets, onions, cucumbers, tomatoes, cherry tomatoes, yard long purple beans, bell peppers, fennel, dill, cilantro, parsley, basil, garlic chives, thyme, rosemary, limes, ice cream, flowers, fresh juicy Mediterranean figs. 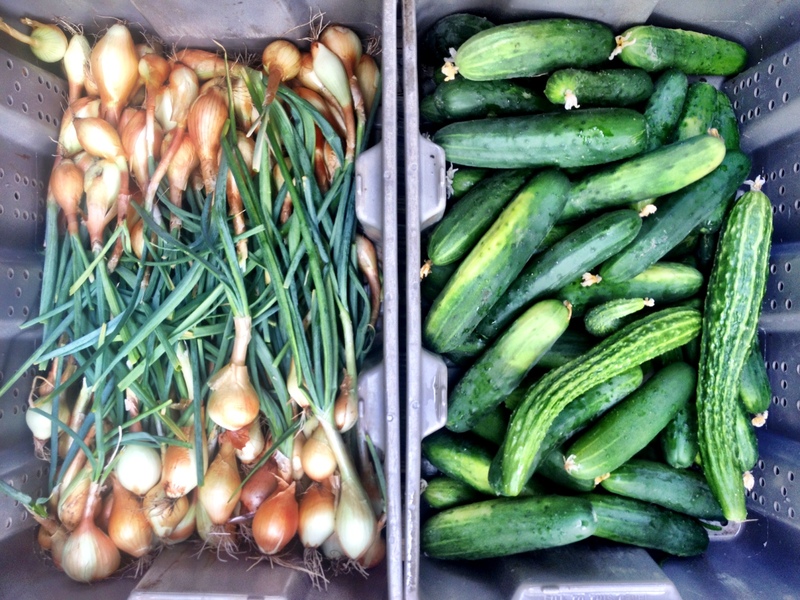 Freshly harvested and rinsed morning onions and cucumbers, ready for bunching and heading up to the farmstand! Happy Saturday! We are also selling assorted organically started herbs and plants! Get a pot and grow some of your own ARTfarm varieties at home! Luca moves trays of ARTfarm seedlings. We have some varieties for sale right now! We don’t usually sell plant stock, but we are conserving water at the moment so you can take advantage and purchase some organically started plants for your own garden! Our Loss is Your Gain – ARTfarm Plants Available! 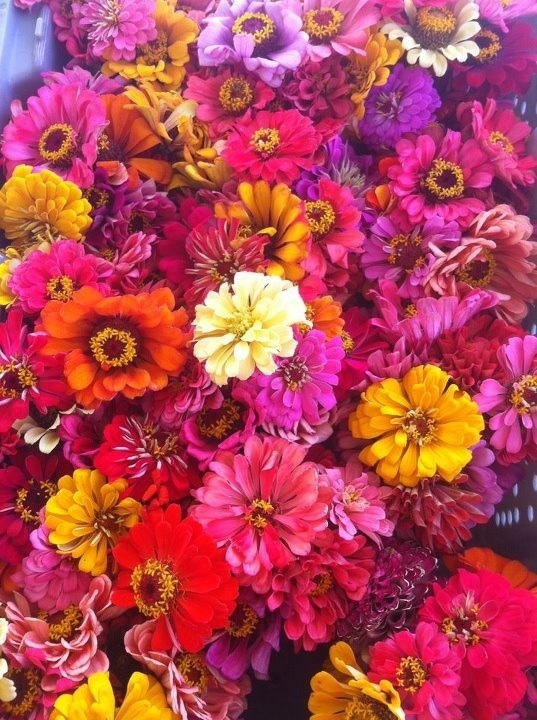 ARTfarm Wednesday stand, 3-6pm today: More plants for sale today! Today’s farmstand includes: sweet salad mix, spicy mix, arugula, cherry tomatoes, slicing tomatoes, broccoli greens, kale, beets, onions, dill, cilantro, chives, basil, peppers, a few cucumbers, beans, ice cream, honey, and figs. It’s dry dry dry, and we are running out of water! So you can hook up with some ARTfarm organically started slips for your own garden or planter box! We will have three types of basil plants for sale! Also artichoke plants and lettuce plants. Plants here means small starts. Passionfruit vines in 1 gallon pots will also be available. Free pineapple plant with any purchase over $20. Yippee!! Saturday Morning ARTfarm! Come early for tomato seedlings! First tomatoes of the 2012 season! We have one half pint of cherry tomatoes for the first lucky customer. ARTfarm Saturday Earth Eve Stand! Celebrate Earth Day tomorrow with healthy ARTfarm food grown sustainably in soil… Oh, wait a minute — you do that every week! Today we have the following earthly pleasures: pineapples! !, baby arugula, arugula, baby spicy, microgreens, spicy mix, sweet mix, zinnias, scallions, chives, dill, basil, lemon basil, sage, thyme, bell peppers, hot peppers, cooking greens, Bodhi beans, ice cream, cherry tomatoes, big tomatoes, lemongrass, bananas. If you want to sequester some carbon this weekend in honor of the holiday, we can supply you with a few pineapple slips for your garden or beautiful drought-tolerant native tree seedlings for beautifying and cooling your home or business. 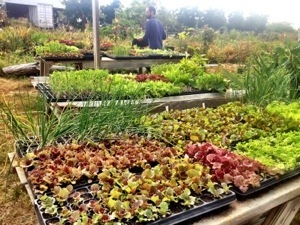 ARTfarm Stand OPEN 3-5:30pm, veggies and plants for sale! 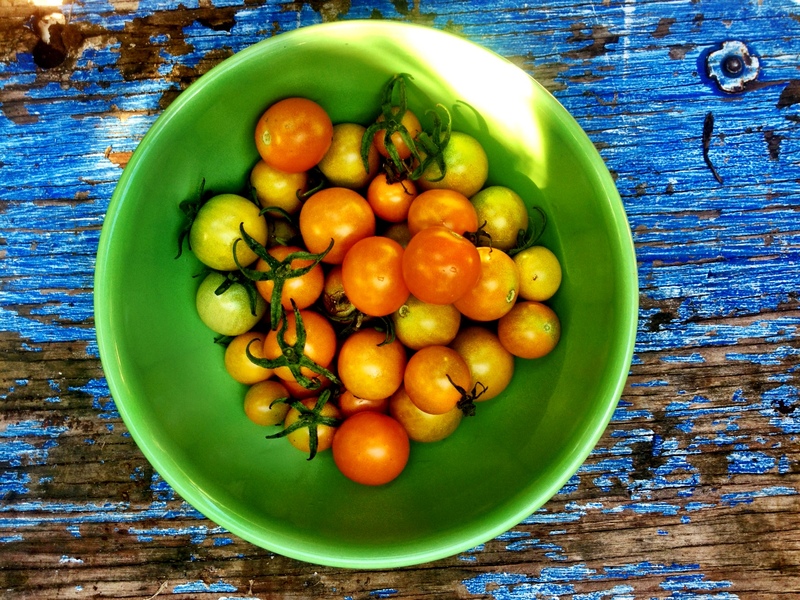 Farmstand open this afternoon, 3-5:30pm! Beat the Saturday morning rush, visit ARTfarm during our Monday and Wednesday afternoon stands. Today we have microgreens, arugula, sweet mix, cherry tomatoes, big slicer tomatoes, heirlooms, lemon basil, Italian basil, dill, cilantro, sage, lots of cucumbers, lots of sweet peppers, cayenne peppers, Bodhi beans, cooking greens including escarole, kale, Chinese cabbage, papayas and zinnia flowers. Cherry tomato plants for sale and native trees! This morning’s farmstand was our last for a few weeks. We’ve got to focus our full attention on some big projects, to make the farm more productive and sustainable in the coming seasons. We’ll reopen in mid-October with a new rainwater catchment pond, some new signs, some new artwork in the ARTbarn and sheep grazing in our pastures! We’re seeding many crops for this coming fall and winter’s harvest now, starting a new batch of native trees from seed, and playing with a few experimental crops including local roasting corn and fig trees. Stay tuned for updates. 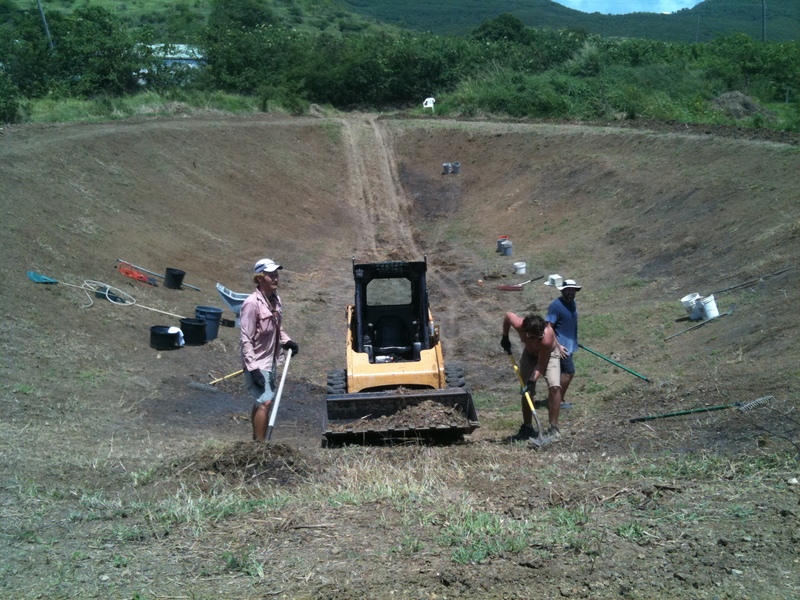 Three awesome ARTfarm workers - Tucker Brown, Eric Gautreau and Adrian Jordaan - in a large Mars-like crater, shovel rocks into the bucket of a skid steer in preparation for the lining of a rainwater catchment pond. If you have some time to spare or know anyone with an interest in and enthusiasm for sustainable farming, we are always looking for reliable nonsmoking volunteers and workers who’d like to help out and learn something new. (It’s not ALL shovelling rocks!) Give us a call at (340)514-4873 or pass our website along to those who might be interested: artfarmLLC.com.